I used to hate Sloe gin when I was younger, in fact I didn’t like gin at all, but like blue cheese and olives it is something I have very much grown into. My Dad always used to make a batch and offer it round at Christmas and I always forces some down but never enjoyed it, something I feel very sad about now I have started making my own. A well known brand of gin now sells Sloe Gin I prefer making my own, its easy, probably cheaper and I can get the balance of sugar to fruit to my own taste. Firstly what is a sloe, Prunus spinosa is the fruit of the blackthorn tree and grows across most of the uk and Europe, once you know what you are looking for they are easy to spot when they are in fruit, with small purple berries with a blue bloom and sharp thorns. 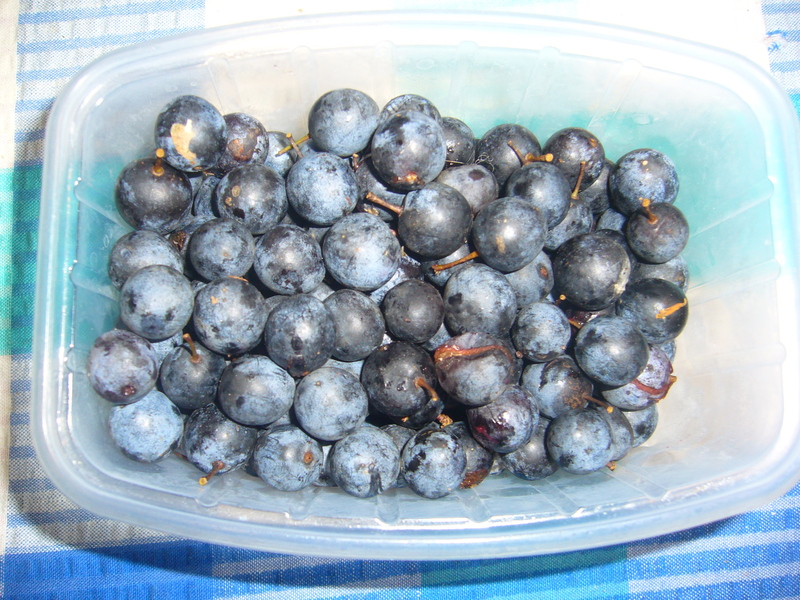 Sloes ripen from August onward but are best picked in October or November. Whilst technically they are edible they are so mouth dryingly sour I think the best thing to do is add them to gin. 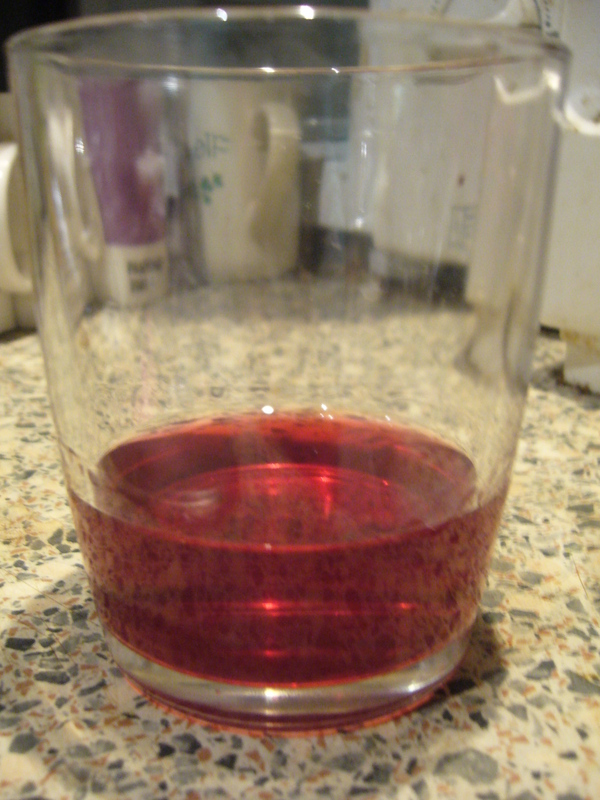 Sloe gin takes a long time to infuse, but after the initial faff you can leave it alone to make itself. The end result is a gorgeous deep purple, plummy liqueur, perfect for cold winter evenings. 1 bottle of gin ( I use a well known supermarkets own brand as anything too subtle would be wasted) and a spare empty bottle, both sterilised with boiling water. 3 or 4 handfuls of sloes per bottle. Sterilise the bottles and divide the gin between the two. Split the sugar equally between the two. Wash the sloes and divide between the two, pricking the fruit with a fork before dropping them into the gin. Store in a cool dark place for at least two month, shaking occasionally. 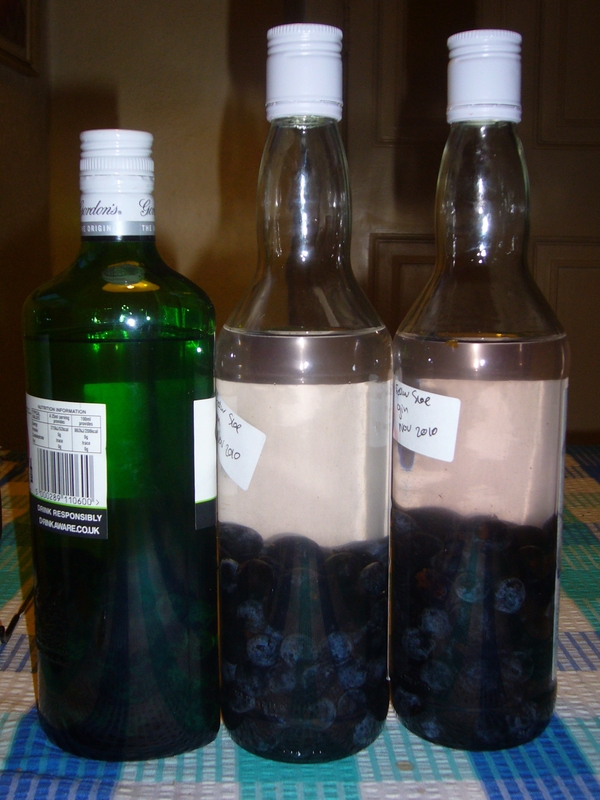 Strain the sloes out of the gin and re bottle. Apparently it can be kept for over a year and matures well if you can leave it for that long! We never do. Can be enjoyed neat, but is lovely with soda water or even a dash in some bubbly for very special occasion.